Doing lawn fertilization in Elkhorn is not easy. Without the proper tools and products, you could end up harming your lawn. Between your personal and professional responsibilities, you may find it hard to fit regular lawn care into your schedule. Luckily, you can come to Heroes Lawn and Landscape for help with routine lawn fertilizer in Elkhorn. This bears repeating: safety must always come first. When you compare programs for lawn fertilization in Elkhorn, choose one that uses the safest methods. Exceptional lawn fertilization in Elkhorn doesn’t end once your yard is rejuvenated. A lawn fertilization service should also consider the well-being of your family and the environment. Besides safety, nutrition must also be a top priority. A mismatch between the grass type and fertilizer can lead to an untidy and lifeless lawn. At Heroes Lawn and Landscape, we perform lawn fertilization in Elkhorn with the safety and satisfaction of our clients in mind. Our specialists in lawn fertilization in Elkhorn know just the right mix of macronutrients and micronutrients to keep your turf healthy all year round. Look for a lawn care company that includes weed control in their program for lawn fertilization in Elkhorn. With the elimination of unwanted grass in your yard, your turf will have a lower risk of malnutrition. This helps your landscaping reach its maximum potential. Our licensed applicators are knowledgeable in the nature of turf and weather conditions in Elkhorn. That means we know which control products and fertilizers best suit your lawn. Successful lawn fertilizer in Elkhorn can’t be accomplished in one go. It requires patience and commitment in addition to expertise. Look for these qualities when you’re searching for lawn fertilizer in Elkhorn services. A perfectly manicured lawn catches the eyes of home buyers. It reflects the care you put into maintaining your home and increases the value of your house in the market. If you plan to sell your property in the future, consider our services for lawn fertilizer in Elkhorn. Investing in lawn fertilization in Elkhorn is your ticket to better surroundings. With professional lawn fertilization in Elkhorn, your yard will be less prone to weed infestations and the diseases they bring. 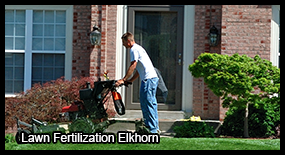 Also, lawn fertilization in Elkhorn promotes the growth of healthy plants. These plants can then act as a barrier to urban pollution and allow fresher air to circulate in your property. You can try lawn fertilizer in Elkhorn yourself, but there’s no guarantee you’ll get your desired landscaping results. Fertilizing requires the right tools and control chemicals that may be complicated to use as well as a schedule that may be difficult to stick to. Instead of relying on guesswork, why not invest in our services for lawn fertilizer in Elkhorn? We’ll spare you from having to spend time and money on an attempt that may have little to no landscaping results. Your lawn doesn’t just beautify your property. If given proper care, it also does wonders for your health. Reap the benefits of having lush grass, increased home value, and a healthier environment by hiring our licensed applicators. We at Heroes Lawn and Landscape will help you maximize your lawn’s potential. For more information, visit www.heroeslawnandlandscape.com. Heroes Lawn and Landscape is a company that brings new meaning to the term, “full-service.” We are much more than just a landscaping company. Apart from landscaping design, we also offer lawn care, lawn maintenance, mosquito control, and holiday lighting services. Heroes Lawn and Landscape was founded by four friends. They noticed that home and business owners had to go to different companies for lawn care, holiday lighting, and other landscaping improvements and maintenance services. Keeping grass, plants, and trees beautiful and healthy requires regular lawn maintenance and fertilizers. However, looking after your lawn can be difficult when you have other responsibilities, such as work and family. Do you want a new look for your outdoor spaces? Turn to Heroes Lawn and Landscape for expert landscaping design and maintenance services. Our team has the skills, experience, and equipment to implement a full-scale landscape design project for residential and commercial clients. We meet with our clients first so we can fully understand their goals. Also, we provide regular updates throughout the course of the project to ensure that our clients and our team are on the same page. Learn more about how we can transform your outdoor spaces into showcases by giving us a call. You may also request a quote by filling out our online form. We look forward to helping you achieve the lawn or yard of your dreams with lawn fertilization Elkhorn.